At one point in your life you need to workout, decorate the house for Halloween and vote…all while drinking. Tonight I have done all three! That’s what I was screaming at this very moment! 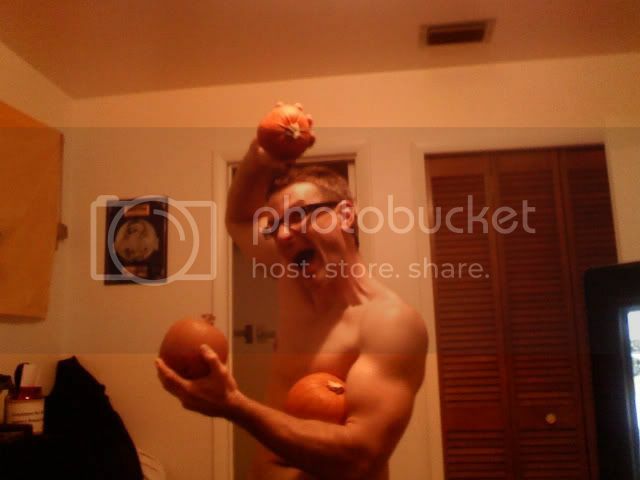 Yes, those are pie pumpkins. Yes, I might have been naked. No, I wouldn’t have thrown my balls at you had I run out of pumpkins. Well I might have. The Love of my life is in New York at this very moment. No, not John Romita, Jr. though the time I met him outside of a small bathroom while I was dirty and covered in blood is one of my fondest memories I’m actually referring to my Queen…my Wife. If you’ve never loved someone what the hell are you waiting for?